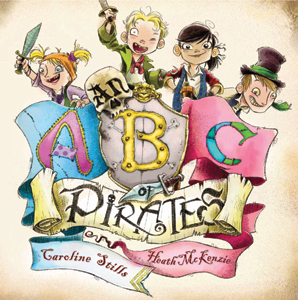 The master of the ABC-123 is back with this piratey illustrative take on the alphabet, penned by talented author Caroline Stills. McKenzie’s signature illustrations bring charm, whimsy and humour to this A to Z line-up, with clever and highly imaginative pirate-scapes, with those lovely little surprise additions he does so well. Stills does a wonderful job of the text – told in rhyme, she manages to navigate the entire alphabet with buccaneering terms and idioms aplenty – and this would have been some task… there’s only so many times you can swab the decks and nip a hair of the dog, me hearties. Kids will love romping along with this series of little boy and girl pirates who navigate the seven seas, spotting the many sneaky additions relating to each letter on each page. My favourite page? The letter N – for the nun, the hilarious nutcracker pirate and the ninja with his nunchunks hiding in the water. Nifty.